Race Team is a brand new racing strategy game. 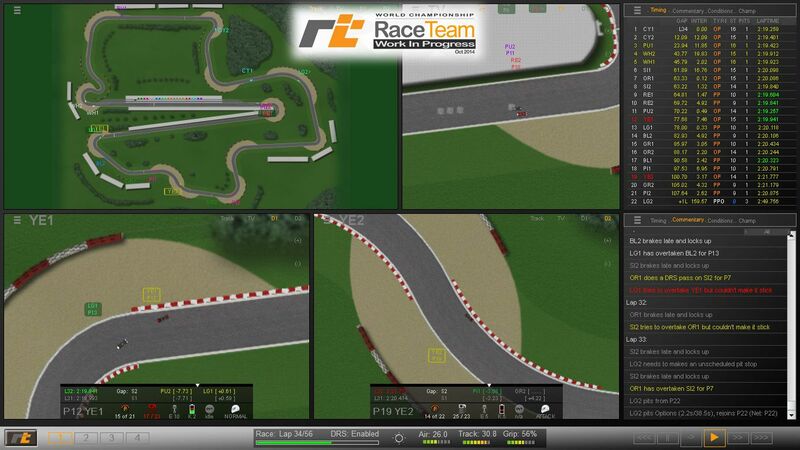 With a fully implemented race simulation engine you’ll be able to watch races like never before in a management game. Using advanced artificial intelligence and realistic physics simulation, the drivers will behave like real drivers, taking optimum racing lines and battling wheel to wheel to produce exciting on-track action. You take control. Set the car up for the track and conditions, decide the pit stop strategy, adapt to the race situation and react to changing weather or unexpected safety cars. All whilst keeping on top of the tyre and fuel management by giving your drivers orders and controlling the hybrid engine settings. The decisions you make could be the difference between winning and losing. There have been many attempts to create a worthy successor to the great F1 management games such as Grand Prix Manager 2 and Grand Prix World, but they have all been false dreams, and never materialized. One, of the problems has been that many have focused on the menu-driven day to day running of an F1 team and not the actual race day race-engine, which is by far the most complex part. But there is a new game in development called World Championship Race Team Manager 2015, where the team have taken the opposite approach and made sure that they have the ground work of having a race simulation engine working, and, wow! the race engine looks stunning! Being developed Purple Sector Games, they have created a page on Steam Greenlight (if you have a Steam account, you can vote 'yes' for them if you wish to do so), which shows off their race simulation engine in a video, which shows off the dynamic looking races complete with realistic looking AI, (not the typical on rails approach of previous Formula 1 Management games).  - Fully implemented race simulation with realistic physics.  - Advanced artificial intelligence that produces exciting on-track action.  - Configurable race interface with custom layouts allows you to watch the action how you want to.  - Instant race action, ideal for race fans that do not normally play computer games.  - Choose from 11 race teams and race on 19 tracks in the World Championship.  - Full race weekends including practice, knock-out qualifying and the main race.  - Multiple game modes, from Quick Race to Career Challenge. We’re very interested to hear your feedback on what you’ve seen so far. This will help us in our development and make the game better. We’re aiming to have a fully playable Early Access version available in the first quarter of 2015. Please vote for us on Steam Greenlight to get the game released. Also please visit our Facebook, Twitter, Google+ and YouTube pages and spread the word. Thank you for visiting and keep in touch. The YouTube video compression seems to have made the video a bit fuzzy. I'm not sure why and what I can do about it as the original video is sharp. Sorry about that, but you will still be able to get an idea of what the racing will be like. Check out the screenshots on the Steam page for better quality screens. Also note that the video was shot with the game set to run slightly faster than real-time so the cars may look like they're going a bit quick. It is a setting that can be changed in game so you can run the game at real-time or faster.